We launched Link2Feed with the goal to be a financially sustainable company that makes a BIG impact on hunger and poverty relief. For seven years, we’ve surrounded ourselves with the top food banks in North America and together, developed a vision of a platform that would not only reduce administrative work and provide access to real-time data, but also transform communities. And now we’re being named one of the best social impact companies in the world! Link2Feed has been listed as one of the world’s top social impact organizations for customers on B Lab’s “Best for the World” list. This is our first time on the list and our score of 46 in the “Customers” section of the assessment has awarded us among the top of all B Corps receiving this honor. What is the “Best for the World” List? 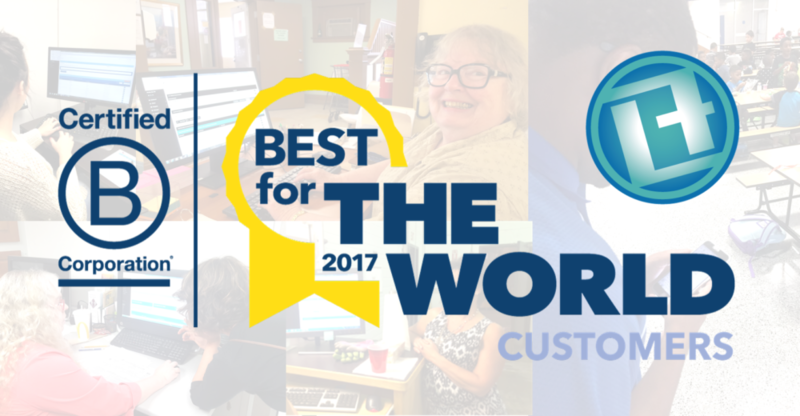 “Best for the World” is a listing of companies that create the most positive overall impact on its customers based on an independent, comprehensive assessment administered by the nonprofit B Lab. The Customer portion of the B Impact Assessment measures the impact a company has on its customers by focusing on whether a company sells products or services that promote public benefit and if those products/services are targeted toward serving underserved populations. The 182 “Best for Customers” companies come from 63 different industries and 29 countries. What Makes Link2Feed “Best for Customers”? “Link2Feed has been an invaluable partner to our organization and network. They are dedicated, professional, and above all else – passionate about their role in addressing hunger in our province and around the world.” – Carolyn Stewart, Executive Director of the Ontario Association of Food Banks. “Our partnership with Link2Feed allows us to gain insights to better serve our community in a way that we never thought possible. We’ll also be the first food bank in our state to go “green” with client data collection. These achievements wouldn’t have been possible without the incredible support and strategic guidance from Link2Feed!” – Cindy Mitchell, Chief Programs Officer at Food Bank of the Rockies. We’re proud to work with nearly 3,100 organizations as far north as Whitehorse, Yukon as far south as Houston, Texas and spanning all the way from Honolulu, Hawaii to Halifax, Nova Scotia. Our platform has already helped touch nearly 1.6 million lives, that’s 1.6 million unique individuals receiving more than 37 million social service transactions. We’ve been a certified B Corporation since April 2014. Our total score is 113; 30% higher than the certifying standing and double the median score of the assessment. We’ve already set our sights on increasing our score next year and hopefully being placed on the “Overall Impact” list for “Best for The World” companies. Thank you to all our customers (the best customers in the world!) for inspiring us every day- the work you do is incredible and we’re so humbled to be a part of it!